From Star Wars: Episode V - The Empire Strikes Back, when the Rebel Alliance was on Hoth. Have you ever been looking for something important and wanted to find it really really badly? Imagine if the things you were looking for were two celebrated heroes of the now-legendary Battle of the Death Star - Han Solo and Luke Skywalker - and you had to search through the vast frozen wasteland that comprises the plains of planet Hoth? Would you commemorate that discovery? You sure would - and now you can! 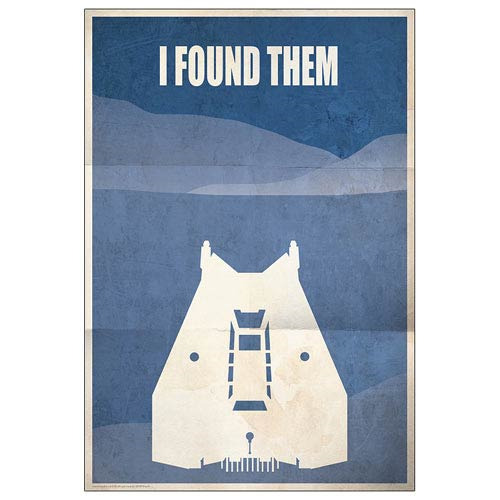 This Star Wars Planet Hoth I found Them Paper Giclee Print is a gorgeous piece of minimalist artwork that truly encapsulates the feeling held by all members of the Rebel Alliance in the Star Wars: Episode V - The Emprie Strikes Back when Han Solo and Luke Skywalker were discovered having survived the unforgiving and deathly cold nights of planet Hoth. Featuring a silhouette image of the Hoth's frozen wasteland of a planet surface along with a Snowspeeder and the quote, "I found them," this gorgeous giclee measures 19-inches tall x 13-inches wide and has been printed on paper, signed by artist Jason Christman, and is a limited edition of 125 pieces worldwide. Ages 15 and up.